Persistence Market Research analyzes the global medical implants sterile packaging market for the period 2016–2024. The core objective of the report is to offer an in-depth view of the key factors impacting the global medical implants sterile packaging market, along with analyzing the future scope and opportunities in this market. The global medical implants sterile packaging market report has been divided into the following four parts for better understanding and assessment of the global market scenario – market analysis by product type, material type, application, and region. The report starts with an overview of medical implants sterile packaging and its usage in various applications across the globe. In the same section, Persistence Market Research covers the global medical implants sterile packaging market performance in terms of value. This section includes a detailed analysis of key trends, drivers, and restraints from the supply and demand perspectives. The next section of the report analyzes the market based on product type and presents a comprehensive forecast in terms of value for the next eight years. The next section of the report analyzes the market based on material type and presents an in-depth forecast in terms of value for the next eight years. The next section of the report analyzes the market based on application segments and presents a detailed forecast in terms of value for the next eight years. The next section of the report analyzes the market based on different regions and presents the market forecast in terms of value for the next eight years. The forecast presented in this report assesses the total value and volume of the global medical implants sterile packaging market. The starting point is sizing the current market, which lays the foundation for forecasting how the market is anticipated to shape up in the near future. Given the characteristics of the market, in-depth analysis based on supply side, demand side, and sterile medical consumption rate is taken into account. However, quantifying the market across the above-mentioned segments and regions is more a matter of quantifying expectations and identifying opportunities rather than rationalizing them after the forecast has been completed. In addition, the report takes into consideration Year-on-Year growth to understand the predictability of the market and to identify the right opportunities across the global medical implants sterile packaging market. As previously highlighted, the market for medical implants sterile packaging is split into various sub categories based on region, product type, material type, and application segments. All individual segments and sub segments have further been analyzed in terms of Basis Point Share (BPS) to understand individual segments’ relative contribution to market growth as this detailed level of information is important for identifying key trends governing the global medical implants sterile packaging market. Also, another key feature of this report is the analysis of the global medical implants sterile packaging market by its revenue forecast in terms of absolute dollar opportunity, which is traditionally overlooked while forecasting the market. Absolute dollar opportunity is critical in assessing the level of opportunity that a provider can look to achieve, as well as to identify potential resources from a sales perspective in the global medical implants sterile packaging market. Furthermore, Persistence Market Research has developed a market attractiveness index for all the segments–product type, material type, application and region – to help identify the real opportunities that lie in the global medical implants sterile packaging market. In the final section of the report, a competitive landscape of the global medical implants sterile packaging market is included to provide a dashboard view based on different categories of market players along with their product portfolio and key differentiators. Medical implants packaged with the objective of preventing any sort of contamination are referred to as sterile packaging. Sterilization is a process that utilizes different technologies to destroy microorganisms. It refers to the method that eliminates all forms of biological agents such as prions, viruses, and other transmission agents. Sterile packaging is not a new term in healthcare and medical packaging; however the concept of medical implants sterile packaging gained a defined structure in the last two decades, with key milestones such as ISO 11607 implemented across the pharmaceutical and medical devices industry. The global medical implants sterile packaging industry has witnessed impressive growth over the last few years owing to significant increase in the number of implant products. Medical implants sterile packaging finds a wide usage in the packaging of spinal, joint, and support implants owing to high performance and anti-contaminant factors. The global medical implants sterile packaging market is estimated to increase at an impressive CAGR of 6.5% in terms of value throughout the forecast period (2016 – 2024). Key factors such as growth of chronic degenerative diseases, regulatory compliances pertaining to sterilization of medical device packaging, and rising expenditure on healthcare and hygiene are contributing to the growth of the global medical implants sterile packaging market. 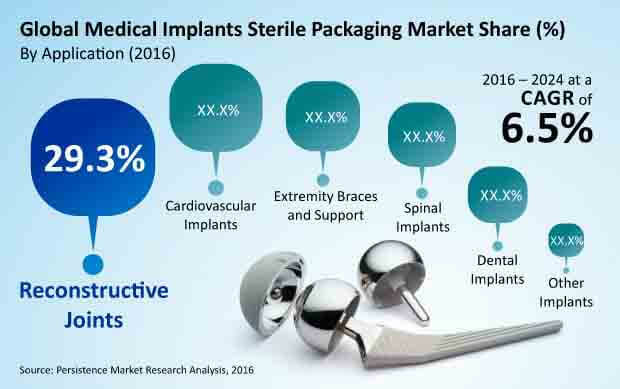 Also, a growing demand for sterilization in implant products such as joint implants, knee implants, hand / foot replacement, breast implants, dental implants, and other small joint implant surgeries has boosted the growth of the global medical implants sterile packaging market. On the basis of product type the global medical implants sterile packaging market has been segmented into pouches & bags, clamshell, blister, tubes, vials, and others. In terms of value, the clamshell product type segment is expected to register a significantly high CAGR in the global medical implants sterile packaging market over the forecast period. On the basis of material type, the global medical implants sterile packaging market has been segmented into plastic, paper, foils, and others. The plastic material type segment is anticipated to create a high market revenue share during the forecast period. On the basis of application, the global medical implants sterile packaging market has been segmented into spinal implants, reconstructive joint implants, extremity braces & support, dental implants, cardiovascular implants, and other implants. Reconstructive joint implants are further segmented into hip joints, knee joints, elbow joints, and other small joints. Extremity braces & support are further segmented into knee, elbow, wrist, hand, and foot/ankle. The spinal implants application segment is projected to witness significant CAGR in terms of volume during the forecast period. On the basis of region, the global medical implants sterile packaging market has been segmented into North America, Latin America, Europe, Asia Pacific, and Middle East & Africa. The North America medical implants sterile packaging market is estimated to account for a high market value share as compared to other regional markets by the end of 2016. The North America medical implants sterile packaging market is anticipated to create a market share of 37.7% in 2016 and is expected to register a CAGR of 6.9% from 2016 to 2024 in terms of value. North America – though a developed market with multiple market players – is expected to gain momentum in the later phase of the forecast period with future investments in the manufacturing sector and automotive manufacturing processes. The mature market of Europe is anticipated to witness uneven growth throughout the forecast period. However, late adoption of medical packaging in several countries such as Poland, Turkey, and Romania offers significant growth prospects for the medical implants sterile packaging market in the region. The Latin America and MEA medical implants sterile packaging markets are expected to register sluggish growth over the forecast period. Selenium Medical, Sealed Air Corporation, Oliver-Tolas Healthcare Packaging, Bemis Healthcare, Janco Inc., Steripack Contract Manufacturing, Orchid Orthopedic Solutions LLC, and Multivac Group are some of the companies operational in the global medical implants sterile packaging market. Among the present players in the global medical implants sterile packaging market, the collective market share held by these companies accounts for 7% of the total market size. Selenium Medical holds a low market share; however this company is expected to show significant growth in the coming years. Orchid Orthopedic Solutions LLC holds a market share of 2.26% while Oliver-Tolas Healthcare Packaging accounts for 1.3% share of the total market.